Every one of us at LoLo takes great pride in providing you with excellent, personal customer service. We only use the freshest, organic, locally grown (when possible) ingredients in every item we offer. LoLo only uses recyclable products. From our cups and lids, to our cleaning supplies, the environment is always our concern. Everything we make for you and your family is made with great care. We absolutely love providing tasty, healthy meals and snacks. We certainly enjoy what we do, therefore, we do it with a smile. 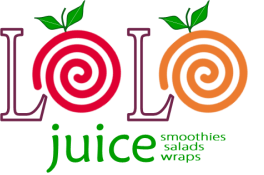 Our goal is to give you a smile every time you visit LoLo Juice.